It was at art college doing a degree in Illustration when I met Polly Dunbar. Right from the start we hit it off and started making things together including shoes in the shape of the Brighton Pavilion, puppets of ourselves on wild nights out and plasticine dogs which we tried to film badly on an old Super 8 camera. After finishing a BA Hons in 1999, I went off travelling and Polly was busy getting her wonderful books published. 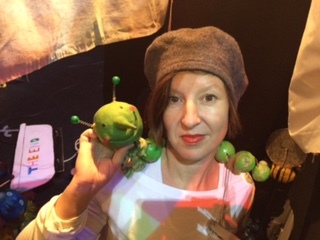 In Australia in 2001 I volunteered with an inspiring company called Polyglot Puppet Theatre, Melbourne and it was here I helped make puppets with all ages helping to tell the stories of refugees who had landed in Australia. After that I got a job in a secondary school, but the best bit was the puppet club as an after school activity. The kids were so enthusiastic. We made all the puppets out of old cardboard tubes and clothes. The kids had so many ideas and it made me realise that if something has a face and you can hide behind it, you can get away with a lot of fun and mischief! With the booth from school, Polly and I decided to make a show based on a book her mum, Joyce Dunbar had written and Polly had illustrated called ‘Shoe Baby’. We had no budget but we did have a lot of old funky clothes from student days and a pot of latex. Serendipitously, we had a very talented musician friend Tom Gray who said he would write a few tunes for us, his fabulous wife Claire who happened to be into puppets too and my great husband Ant who is an actor! We spent the summer of 2005 making puppets and rehearsing on Tom and Claire’s lounge with wine and hired the little theatre above The Marlborough pub in Brighton to put on our show. We hand made the tickets and sold them to family, friends and people we collared in the street. After 4 sell out shows, we decided to perform at Brighton Fringe in 2006 where to our disbelief we won ‘best children’s show’…and as they say ‘the rest is history’. Setting up Long Nose with Polly and the team is a dream come true. We have had some incredible adventures performing at The Edinburgh Fringe, The National Gallery, over a hundred theatres and schools all over the country with the wonderful team. Even breaking down in the van has proved fun…and I hope it never ends…..
Katherine has described how we met and how Long Nose Puppets came about so there's not much more for me to add. 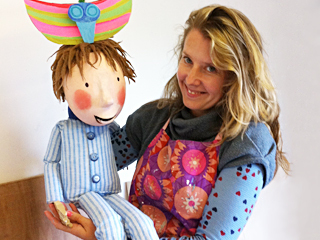 My brother says “You can’t call making puppets ‘work’ you and Katherine have far too much fun, you just laugh all day.” and that’s pretty much how it is- long may it last! 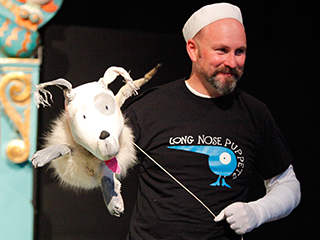 Ant has been co-devising and puppeteering with Long Nose Puppets since its inception back in February 2006. He graduated with a First Class Honours BA in Theatre Studies from The University of New England in Australia in 1992 where he directed Samuel Beckett’s Catastrophe and What Where and then spent many years working as an actor in theatre, television and film. Highlights include playing Edmund in A Long Day’s Journey Into Night for The New England Theatre Company, D.H. Lawrence in a stage adaptation of Lady Chatterley’s Lover for Melbourne company Performing Arts Projects and a humorous stint as Tony Farmer in Channel Nine’s Neighbours. ​His first puppetry experience was with two rat puppets in a short film by Katherine Morton (then Smith!) called Rock and Roll and he has been puppeteering ever since. He also teaches Theatre Studies, English Literature and English Language at Bartholomew’s Tutorial College in Brighton. Tom, who is in the very successful band 'Gomez' is a great friend of Katherine, Ant and Polly's. Having met Tom through his wife Claire, he offered, very generously, to write a 'few tunes' for our first show 'Shoe Baby' which we performed in a pub in Brighton in 2006, His 'few tunes' involved a whole album of playful, zany songs which stuck the piece together with magical musical glue. Tom has gone on to write 6 Long Nose albums full of wonderful songs and is a key member of the creative team. Ozzie trained at Guildford School of Acting graduating long long ago, after graduating as a Horticulturalist even longer ago! Ozzie moved to Brighton 6 years ago after always longing to live by the sea. ​During his acting career he has focused mainly in Children's Theatre: most notably the protagonist, Pickle (Jam theatre), the Dog in the Tinder box and a Lorry (Walking Forward Theatre Co)! Ozzie currently divides his time as a Gardener, (a business run by Geoff, his dog) and working with Long Nose. Sophie studied Drama and French at Bristol University, since then she has under taken further training with Philippe Gaulier, Little Angel Theatre and John Wright. 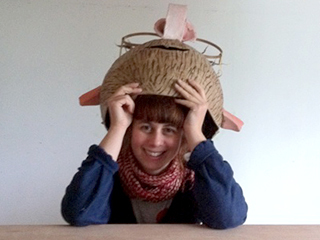 As a perfomer her practice focuses on devised work , clown , mask, puppetry and object animation. Sophie has undertaken a wide variety of teaching work varying from workshops in the community to regular contributions at Rose Bruford Drama School. Emily joined the team in 2018 having had a break from performing to train as a physio and be a mum. She trained at the Legat Ballet School & then the Royal Ballet School and went onto tour the UK & Europe, Hong Kong and Australia dancing in classical ballets such as Swan Lake & Cinderella. Emily is enjoying being back stretching her arms and contorting herself in the Long Nose booth.